It is officially the first hour of Fall 2018! I published the blog about the 50th book 30 minutes before the official end of summer. When I began the #DBC50Summer journey in June, I had no idea what it would look like at that point. I typically begin with the end in mind. In this case, I took a major risk. I had an idea and I just went for it. Not only did I go for it, but I jumped in head first by letting the owners of Dave Burgess Consulting, Inc know what I was doing before I even really knew what I was doing. From that moment, Dave and Shelley Burgess have been nothing but supportive. Their team at DBC, Inc is incredible; Wendy and Tara are two of the nicest people you’ve ever interacted with in your life! I have felt encouragement, support, and enthusiasm from everyone at DBC, Inc and I cannot say thank you enough for that! Only having less than 2 weeks to read and blog about 10 books was insane! I was at a point where I literally read and blogged about a book a night. You may have noticed (especially if you’re subscribed to the blog) that the posts were coming around 1:30-2:00 AM every night. That’s when I was publishing. You would think that I have been exhausted. You would be wrong. I have been more energized than ever before in this journey! I quietly wondered if the integrity of the quality of books would be in question as the quantity of books increased. Short answer: DBC has just gotten better with time. Through reading the first 50 books, in order of their release date (to the best of my knowledge), I have watched the transformation of DBC, Inc. I am absolutely blown away . by the fact that every. single. book compliments the Teach Like A Pirate message. These books never contradicted themselves. They built on one another in a logical manner, pulling you deeper into the PIRATE pedagogy with every page. It is abundantly clear that Dave and Shelley take great pride in their authors and they are still very much running the business, both in name and in practice. I do not believe for a second that the continuity between books would be present if they weren’t (wait for it…) steering the ship at every turn. They are clearly invested in their business through their investment in the authors they publish. Dave set out to disrupt the publishing business, and disrupt the business he did. I stand (errr, sit…) in awe of the dynasty they have created from the ground up. Dave and Shelley have kickstarted a revolution in education through their publishing business and I am so excited to see what they have coming up for us next! Three days ago, I saw this post was pinned on Dave’s Twitter profile. Although Dave saw this at a fitness center, this quote applies perfectly to my experience with #DBC50Summer. I believe there were times that the Captain himself even doubted that I would meet my goal of reading the first 50 of his books by the end of summer (though he never said anything about it). Heck, there were times I doubted it. When my youngest daughter was hospitalized and diagnosed with Type 1 Diabetes in early August, when I was traveling throughout the western half of North Carolina doing four presentations each day then driving hours to our next destination for two weeks in July (I presented 32 one-hour sessions in 8 days), when I was spending late nights at the softball field with my oldest daughter, and when teachers came back to work in late August, I was certain that the first day of fall would come and go as I continued to work on #DBC50″SUMMER”. The unending encouragement from my professional learning network and the absolutely spectacular authors of DBC, Inc get full credit for inspiring me to keep going and push through these obstacles to achieve my goal of reading the first 50 books by the end of summer. Even those “without a dog in the fit” so to speak (the authors of books 51-57) have shown support through Direct Messages on Twitter, text messages and encouraging tweets. I am forever grateful. On August 27, I experienced an hour unlike any other. I actually found Cloud 9 and hung out on it for a while… I was honored to host #tlap that night to share my experiences with #DBC50Summer and discuss the entire DBC, Inc line. This was a great celebration of the authors and the ideals shared in each book, and I hope that those who participated were able to walk away with new books on their Amazon wishlist! Let’s check out the last ten books in #DBC50Summer! 41 – Be The One For Kids by Ryan Sheehy: This book lit me on fire to be an advocate for every student. It also reminded me that even though I can’t possibly be the one for every student, I never know which one I will inspire and motivate. Because I don’t know which one(s) will be touched the most, I should do everything in my power to be the one for them all. 42 – All 4s and 5s by Andrew Sharos: This book is advertised for Advanced Placement (AP) teachers. But ohhh the power of false advertisement. This book is actually for EVERY teacher! Why should AP students be the only ones held to high standards? That’s exactly what Andrew shares with us in his book! Don’t let the intended audience fool you. You need this one in your hands yesterday! 43 – Shake Up Learning by Kasey Bell: Static learning won’t work for students in 2018! (It also didn’t work for students in 2006 when I started my career, but I’m learning to forgive myself because I didn’t know any better.) Kasey inspired me to step out and apply to earn my Google Teacher Certification. Get her book to see what dynamic teaching is and why it’s what’s best for our kids. 44 – The Secret Solution by Todd Whitaker, Ryan Donlan, and Sam Miller: Unlike any book in the DBC, Inc line, this book takes us on a fictional journey inspired by real events. We experience the inner-workings of a typical school that could be found anywhere in the US. A principal (Roger Rookie) is trying to find the secret to being a great leader. He fails over and over again. What does he find the Secret Solution to be, or is there even a Secret Solution? Grab this book – and you don’t have to be a principal to put it on your wishlist! 45 – Let Them Speak by Rebecca Coda and Rick Jetter: The power of student voice cannot be understated. Meet students on their turf and get their opinion, but only if you’re ready for the honest feedback you’ll receive. Then, do something about what they say. They deserve to be heard. So let your students speak. 46 – The Path to Serendipity by Allyson Apsey: The big secret of #DBC50Summer can be found in this post. Allyson’s book is the real catalyst! The post for this book written weeks before #DBC50Summer started. This is one of those books that you’ll get something different out of it every time you open it. I actually deleted the majority of the first post to rewrite a new one because I was inspired by something altogether different the second time around! Allyson takes us on a journey of self-discovery that you don’t want to miss! 47 – Lead with Culture by Jay Billy: Jay is the real deal, y’all! His book has me excited to go on a treasure hunt this year for evidence of positive culture! Check out the post to play BINGO and use the link within it to purchase Jay’s book, the very first book in the Lead Like A Pirate guide book series! There are more to come! 48 – Sparks in the Dark by Travis Crowder and Todd Nesloney: This. Book. Though. What do you mean, you don’t have it? Go get it. Now. It will transform your reading and writing instruction (and all other content areas) for the rest of your career! You will fall in love with reading and writing, and so will your students if you use these strategies! 48.5 – Sparks in the Dark by Travis Crowder and Todd Nesloney: What happens when you’re 48 hours away from the end of #DBC50Summer and you are inspired beyond belief by a book… you write a second blog post, of course! This one had me breaking all the rules. Lucky for me, I know the lady who made the rules. We chatted… it’s okay. (HA) Check out Part 2 of Sparks in the Dark #DBC50Summer blog post! 49 – The Pepper Effect by Sean Gaillard: Why does Monday have such a bad reputation? Why can’t we celebrate a new beginning? That’s exactly what Sean did through #CelebrateMonday! Find out what inspired the movement and how Sean connects his passion for The Beatles into his own schoolhouse as principal! The author is a friend of mine… he’s as genuine as they come! You want this book, even if you’re not a fan of the music. 50 – The EduNinja Mindset by Jennifer Burdis: She competed on two seasons of American Ninja Warrior but that wasn’t the hardest thing she ever did! Find out what was the hardest thing she ever did. You’ll also discover how to set goals and get out of your own way to achieve them. This one is a book for the masses! The perfect book to end #DBC50Summer on! My implementation plans and flipgrid links for each book are listed in a nifty spreadsheet here. I also suggest checking out each of the Recaps from earlier in the summer: Summer Recap 1, Summer Recap 2, Summer Recap 3, and Summer Recap 4. That’s it; that’s all folks… but wait. #DBC50Summer may be over, but I’ve still got one more blog post to write! You’re going to want to see this one! I have been asked a dozen questions by coworkers, administrators, PLN members, and members of the Pirate crew (immediate and extended)! I address them all in the final #DBC50Summer post, as well as sharing a HUGE announcement! I’ve always enjoyed the shiny things in life. I love the feeling of “new”. I’m guilty of tossing something in our house because we just need a “new” one. (It drives my husband absolutely crazy.) I have to admit that I’m the same way with technology. When virtual reality started to become readily accessible in the classroom I was given the opportunity to participate in research with the organization, Foundry10, and I jumped on it! I had no idea how we were going to integrate VR, but I knew I wanted to try. I started out by co-planning lessons that stemmed from the use VR rather than creating ways for VR to enhance the lesson. In the Disney movie Moana, there is a song that the crab sings called “Shiny”. This song reminds me so much of technology and how many of us (myself included) gravitate toward the latest and greatest in an effort to be as shiny as possible. Newsflash: kids aren’t that impressed with the shiny. After the first few VR experiences, my students are more difficult to impress. They’ve seen the shiny and moved on. As teachers we can’t chase “anything that glitters” – we need real ways to help propel education forward. 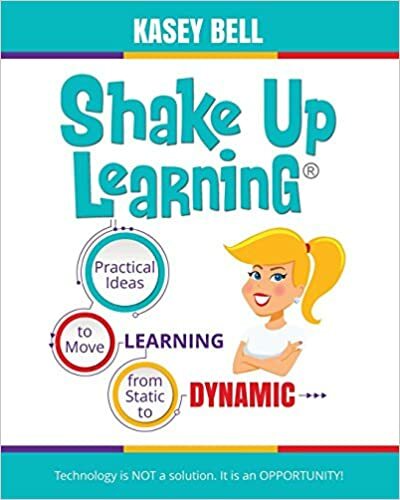 I believe that Kasey Bell has the solution in her notion of Dynamic Learning Experiences as described in Shake Up Learning, the 43rd book published by Dave Burgess Consulting, Inc.
Reading this book was an eye-opener. This is the first book in which I’ve used the space available at the end of every chapter to share my reflections and connections to the chapter. I connected with Kasey from the very beginning, when she described her early years of teaching as a reproduction of how she was taught. I, too, gave problem after problem in math, allowing 2-3 minutes for students to work it out, then showing the entire class how to correctly answer the problem on the overhead, whitebard, SMARTboard, or under the document camera – all that technology just a waste in my classroom for years. It wasn’t until I moved past my fear of change into the realm of risk-taking that I really began to understand that I was doing my students a disservice. And now… I get frustrated that others haven’t reached that same epiphany in a more timely manner. Ironic, much? Thinking through this book as both a teacher of students and of teachers brings new insight. Focusing on what the students can do with the tool, rather than the tool itself will be imperative as we continue to move forward one step at a time. In our makerspace, we have more tools for learning and creating than we really know what to do with. Our goal in makerspace managers is to create playlists for students and teachers about the tool by creating unboxing videos, tutorial videos, and “what do I do with this” videos. I’m excited to see where this goes and hopeful that our makerspace will be used more this year. I think people just don’t know what they don’t know. The fear of moving into this space with so many unknown tools can make both teachers and students feel a little uneasy. It is my desire to erase that fear this year. As I read through Kasey’s book, I was continually hit with the notion of Google Keep. In my blog about Ryan Sheehy‘s book Be The One, I mention my desire to use Google Keep to keep myself organized with a checklist. I believe Google Keep is a hidden gem in the Google Suite and I want to uncover that gem for my students and teachers. This is the perfect way for my students to keep a planner, and a way for teachers to stay organized and allow students to create their own learning goals. This tool is constantly showing up in my readings, as well as in professional development and I’m feeling more and more certain that this is a tool I’d like to present to our district’s Digital Learning Leaders in October. Kasey speaks to using Google Keep, Diigo, and Pinterest as ways to curate resources through digital bookmarking. Curation is so important for both teachers and students. I have used Google Classroom to curate resources for my students, and am thinking Google Keep is a great outlet for curating makerspace playlists, as well as available Virtual Reality content, for my teachers. I love to learn completely new things! Sometimes I feel as though I’ve reached that point where there’s not a whole lot that impresses me or excites me with technology, as I have used or seen a tool used in multiple ways. The past few years I have attended conferences, I’ve had a lot of “me too” moments. I have been exposed to 360-videos and own the Ricoh Theta S. (We used it in our search for a new home and it helped us pick a home because we had the ability to take a virtual tour of the home. They all run together after seeing 5 or 6 of them in a short period of time.) I started my first makerspace 5 years ago and have been doing high-end virtual reality with the htc Vive for the past 3 years. My school is 1:1 Chromebooks (has been for over 5 years) and has a successful and often used Bring Your Own Device policy. We’ve had 3d printers for at least 4 years. My students have grown up with MinecraftEDU in their media center and we use game-based learning in many of my classes. Gamification is the foundation of EPIC Academy, a teacher professional development model created by my friend and mentor, Lucas Gillispie. I don’t say all of this to sound pompous or arrogant. It’s just to say that when I hear about something I was unaware of, I get really pumped! This is one reason I loved Kasey Bell‘s Shake Up Learning so much! There are several things I learned about in this book that I’d never heard of, or with which I had limited interactions. One of those things was Google Alerts. I immediately went to set one up for my name, this blog, and #DBC50Summer. I was blown away by the customization and ability to find information about these. I even found a quote from a local newspaper that I was unaware was listed. I can’t believe this service is out there for free! Go check out alerts.google.com! There are so many practical applications from this book! Choosing one implementation from this book was so difficult because there are oodles and oodles (yes, real words, promise) of reproducible information shared in the pages. I like the idea of choice menus, and I love that Kasey gives multiple examples for various audiences! I like the Dynamic Learning Experiences lesson plans, and I love that Kasey pulls in some spectacular educators to share their own DLE at the end of the book, as well as giving us space to write our own. I like that Kasey implements the ISTE standards and P21.org skills of the Four Cs, and I LOVE that she puts it into an easy-to-understand graphic that brings DLE to the forefront of planning. My implementation plan comes from the idea that we should be teaching our students and teachers how to fish, not bringing them the fish daily. As an instructional coach, my ultimate goal is to work myself out of a job. I want my learners (whether they are students or teachers) to be able to sustain their own search for knowledge. In an effort to model this, I am going to take the Google Certified Teacher exams this year. I will definitely take (and expect to pass) the Level 1 exam, and would like to carve out the time to take the Level 2. Between this and creating collaborative Google Keep notes for curation among teachers, I’m hoping to begin taking the first steps to empower my teachers to find their own answers. If they are empowered to find their own answers, they will, in turn, empower students to find their own answers. I very much enjoyed Shake Up Learning and really appreciate the message Kasey shares with educators in her book. Letting go of fear and control is necessary in creating an environment where students feel more comfortable taking risks and failing forward. I would recommend this book to any teacher and administrator who is eager to move from the way it has always been to the way it should be. I’d also recommend this book to the exact opposite audience in hopes that Kasey’s words might be the nudge needed to begin the transformation in their own classroom. Kasey practices what she preaches by making resources available outside of her book. For more on Shake Up Learning, check out the hashtag #ShakeUpLearning and her website here. There’s no better time to start than now as she is hosting a Book Study beginning on September 27! More information can be found here. The Google Teacher Tribe podcast is a must-listen as Kasey and Matt Miller (author of Ditch that Textbook and co-author of Ditch That Homework) begin season 3 on Monday, September 17! The flipgrid is available here. Thanks to my pal, Andrea Paulakovich, for allowing me to co-pilot this incredible idea of hers to have a global collaboration space for each DBC, Inc book! I also have to say as a southerner, that these shirts are amazing! I will be ordering one as soon as I click publish here! She also shares a companion resource website within the pages of her book, but you’ve got to get the book for that! You won’t be getting it from me! Go grab your copy of the book now so you can start your journey in moving from static lessons to dynamic learning experiences! I’ve learned enough about DBC, Inc books by now to know that even though book 44 appears to be another book for administrators, I should prepare myself to take away something epic as a non-administrator. The Secret Solution by Todd Whitaker, Sam Miller, and Ryan Donlan is up next! Just taking a sneak peak into the cast of characters provided in the first few pages has me excited to see where this one will take me!